Jenni Lake was a 16-year-old sophomore when she started experiencing migraines. Concerned, Jenni’s parents took her to see the family doctor, who recommended that Jenni go for an MRI. That one test would change all of their lives forever. Jenni had a mass on the right side of her brain. More testing would reveal that the mass was much bigger than originally thought. A biopsy would provide the diagnosis – stage three astrocytoma – a type of brain tumor. The tumor had also spread to another part of her body without any symptoms. She had three other tumors on her spine. After the diagnosis, Jenni and her parents sat and talked with the hospital doctors to discuss her options and chances of survival. Even with chemotherapy, she only had a 30 percent chance of making it to her 18th birthday. From the beginning, Jenni’s father, Mike Lake, was awed by his daughter’s strength. Jenni’s mom, Diana Phillips, did recall a weak point for Jenni though. “When they told her that she might not be able to have kids, she got upset,” Diana stated. The third child in a family of eight children, Jenni had always wanted to be a mother. But while discussing the treatment options, doctors told her that she might not be able to have children because the chemotherapy treatments could make her sterile. Yet, despite the potential loss of motherhood, she went forward with her treatments. Nathan Wittman, Jenni’s boyfriend, stood by her side through it all, despite the fact that the couple had started dating just two weeks before the diagnosis. He stayed, despite the fact that she might not live. He stayed with her when she lost her hair from the chemotherapy treatments. He stayed with her through the sick and weak moments, and he was still there, despite the gossip at school. And despite Jenni’s weak and sick moments, the couple continued to dream. They talked of opening a restaurant or a gallery someday. By March, Jenni’s tumors were starting to shrink, so it seemed that the couple had room to dream. But then the unthinkable happened. Jenni had started throwing up and she was experiencing sharp stomach pains. Early one morning, she and Nathan went to the emergency room. According to her family, when she came home, she went to her room and cried. The teen was 10 weeks pregnant. The couple hadn’t given much thought to birth control options because they had pretty much assumed that the chemotherapy treatments would make her sterile. Jenni now had a decision to make. The brave teen chose to stop her treatments. She may not have considered how the decision would impact her future, but her parents say that they didn’t really see it as a life or death situation. They believed that since the tumors had been shrinking, Jenni would be okay to complete the pregnancy and restart her treatments after the baby was born. “I guess we were just hoping that after she had the baby, she could go back on the chemotherapy and get better,” Diana stated. But Jenni wouldn’t make it. Her tumors grew, and by the time she delivered, the damage was too extensive to continue treatment. Before delivery, she pulled her nurse down next to her and told her something that she hoped would comfort her parents after they learned the devastating news. “She told the nurse, ‘I’m done, I did what I was supposed to do. My baby is going to get here safe,” Diana stated. She didn’t leave before spending time with her little miracle, Chad Michael, though. Photos were taken of Jenni and the baby after his birth. Even her last words were about her son, whom she could barely see because the tumors had started to take over her vision. Her father had placed the baby beside her one last time before she died. “I can kind of see him,” she said as she felt for little Chad, just 12 days after his birth. 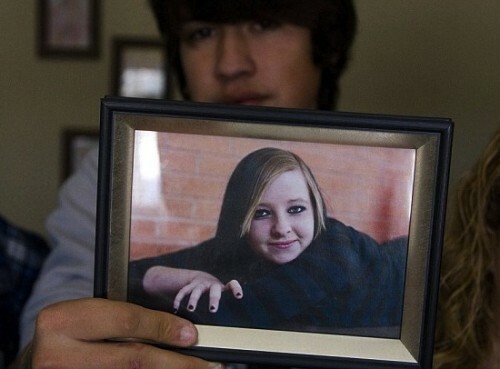 Her family spent Christmas without her, but ornaments, just for Jenni were on the tree. They remembered her laugh. They remembered her rebellious streak. And little Chad Michael was there – a remaining piece of Jenni. And despite the sadness that shrouds Jenni’s story, her closest friends and family say it wasn’t a tragedy. It was a sacrifice. Jenni gave her own life to ensure that her son was able to make it safely into the world – the son she never thought she would have. The son that may help bring healing to the hurting hearts of those that loved Jenni the most. Rachel Zoe & Her Family Spend The Holidays on The Beach in St. Barts!